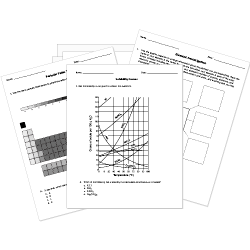 Check out our pre-made Chemistry worksheets! You can create printable tests and worksheets from these Grade 7 Atomic Structure questions! Select one or more questions using the checkboxes above each question. Then click the add selected questions to a test button before moving to another page. The smallest particle of an element is a(n) . Matter is made up of . Carbon has a mass number of 12. Thus, it has protons and neutrons. An atom's nucleus contains . An ion of the element carbon has a different number of . If atoms lose an electron, they become positively charged. A(n) has a positive charge. If atoms lose an electron, they become negatively charged. Electrically charged atoms are . Who thought atoms were "uncuttable"? Protons , neutrons , and electrons are the three basic parts of an atom. Who conducted experiments in combining elements? A negatively charged atomic particle is called what? Electrons have a negative electrical charge. Protons have a positive electric charge.